Brew up for your local heart charity this spring! How can every tea party you hold this Spring could save many lives throughout Wales? In the event of a cardiac arrest, a Defibrillator significantly increases the rate of survival when CPR is also administered. With the majority of cardiac arrests occurring outside of the hospital, it is essential that this lifesaving equipment is publicly available to all local communities. By holding a tea party, bake sale or coffee morning, communities can help raise funds and more importantly awareness about the importance of Defibrillators in our local communities. BBC Welsh correspondent and presenter Sian Lloyd is helping spearhead an all-Wales tea party campaign to save lives in Wales in collaboration with Welsh Hearts Charity. The charity is inviting everyone to invite friends and colleagues together in the workplace, school or community to hold their own tea party, bake sale or coffee morning. A fundraising pack has also been prepared to support interested individuals and groups to make the most of their community based event. Every penny raised will stay in Wales, and will directly benefit local communities. To download a free fundraising pack visit http://welshhearts.org/teaparty. 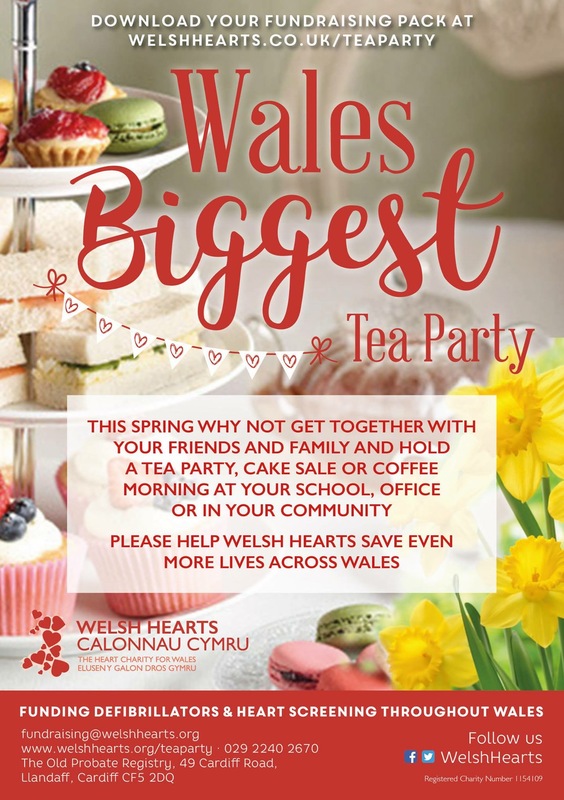 Sian is encouraging everyone in Wales to also hold a tea party this spring for the charity Welsh Hearts! She will also be asking her colleagues in the BBC Wales newsroom to raise a mug or two for this great Welsh cause!